"Sales of a major HD game title" - Sleeping Dogs, in other words - are to blame for Square Enix's lost profits. Square Enix has released its profit forecast for the six months ending September 2012, and the numbers don't look good. 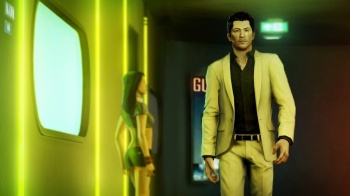 The revised forecast has net income slashed by over 60%, thanks in part to slow sales of its sandbox Hong Kong action game Sleeping Dogs. Sleeping Dogs did well in the UK, but didn't light the US retail market on fire. It sold under 300,000 units in the US in its debut month, and wasn't on the Top 10 sales chart for very long. The report states that its sales "have been growing at a slower pace than expected," which sounds like a polite way of saying they haven't been growing at all. However Sleeping Dogs isn't the only underperforming asset. Delays in its social gaming launch and poor arcade machine sales were also cited as reasons why the profits forecast had to be revised. A strong Yen, inhibiting exports, doesn't help matters. A foreign exchange loss of "about Â¥1.1 billion [over $13 million] as non-operating expense" was down to overseas assets in foreign countries losing value in relation to the Yen. Square isn't looking forward to the future either. Profit forecasts for the fiscal year ending March 2013 have also been revised downward, due to "uncertainties of the business environment." A .pdf English language version of Square Enix's forecast report can be found here.